Do you ever tire of Red and Green Christmas Card? If you do, it's your happy day. Non-traditional Christmas colors are trending. Today's Wondrous Wreath Christmas Card takes neutrals way beyond boring. Love the three step stamping of the Wondrous Wreath stamp set. My base layer is Crumb Cake. Layer two was stamped twice. First with Soft Suede Ink, then I inked it a second time with VersaMark Ink and Gold Embossing Powder. Hint: The Gold layer was slightly offset. I inked the third stamp with Early Espresso to create yummy dark brown berries. Metallic Sequins and Gold Cording Trim are two of my favorite accessories. With both you get a lot of bang for your buck. For a mere $5 you get a whopping 750 Metallic Sequins. That little container is bottomless. Tip: The new Fine Tip Glue Pen is fabulous for attaching these little beauties. And with 25 yard on each Gold or Silver Cording Trim Spool, I will be weaving and twirling a lot of cording through my Christmas projects this year. The "Joy" and the bow are Gold Foil Paper cut with the Wonderful Wreath Framelits and my Big Shot. And finally, a Christmas Card this fabulous calls for a fun Designer Envelope. Create a beautiful look of layers and colors easily with the masking technique. 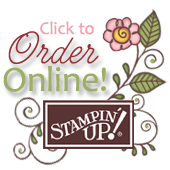 Now through November 9 receive 3% more Stampin' Rewards with any qualifying order. Our grandson, Connor, has a birthday coming up and since he gave me some very specific tips on things to add the next time I made cards, I made sure to incorporate his "tips" when making his birthday card. No plain white envelopes. It should be colored and it should have a design. That's a BIG ENVELOPE! But, envelopes are super simple to make with the Envelope Punch Board, so no problem. This card is BIG & TALL, just the way boys like it. Yep, it's perfect for a soon to be 7 year old. I stamped my background using the Stampin' Up! No Bones About It stamp set and Whisper White Craft Ink. What a super fun and cute Boy's Stamp set! Then, I embossed the whole thing using White Embossing Powder. And finally, I sponged over the whole thing using Delightful Dijon Ink. So Cute! The Dinosaur Bones are perfect for this technique. And what 7 year doesn't like jokes? The inside should bring a smile too. Thanks to Mojo Monday for the Tall and Skinny Card Sketch. My card is Tall and Skinny, just a little bigger than was suggested.